On U.S. Sen. Sherrod Brown’s weekly Wednesday conference call with reporters when the Senate is in session, he responded to my question of whether he would be a co-sponsor of a bill Vermont U.S. Sen. Bernie Sanders is ready to introduce that would create a new single payer system for all individuals. Instead of co-sponsoring Sanders’ bill, he told reporters that he has plans of his own to introduce a bill allowing Buckeyes and anyone else age 55 and over to buy-in to Medicare. There are 41 million Americans between the ages of 55 and 64, and millions of them are burdened by high insurance premiums, unaffordable deductibles, and limited options, a media release Thursday from Brown’s office said. 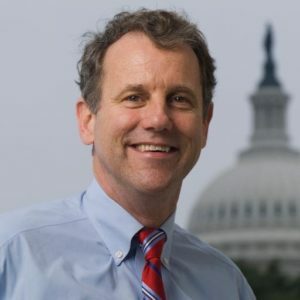 Brown introduced the Medicare at 55 Act with an impressive suit of Democratic Senators, including Debbie Stabenow (D-MI), Tammy Baldwin (D-WI), Sheldon Whitehouse (D-RI), Patrick Leahy (D-VT), Jeff Merkley (D-OR), Jack Reed (D-RI) and Al Franken (D-MN). Brown’s office said people in the 55-64 age group face unique health challenges and especially high health care costs. The average person in this age group, they say, pays more than $1,200 in annual out-of-pocket costs and is at a greater risk of suffering from chronic conditions such as diabetes or arthritis and medical emergencies such as heart attack and stroke. Under the Medicare at 55 Act, an individual between the ages of 55 and 64 who buys into Medicare would receive the same benefits and protections as an individual enrolled under Medicare parts A, B, and D.
Brown, who is running for his third term next year, said he worked with Senate giant Ted Kennedy on a similar bill, coming within a vote of it passing. One reason he offered for why he won’t be on-board Sanders’ effort is that he wants to “get something done we can get done,” which according to his thinking is to make individuals 55 to 64 years of age eligible to buy-in to Medicare. “Early buy-in [to Medicare] is the best,” he said, noting it’s something he worked on for 20 years.